The water vole - made famous through the ‘Ratty’ character in the Wind in the Willows children’s story - was once a familiar site in the Kielder area until predatory mink invaded its stronghold and wiped out the population. The last local sightings of water vole go back to the 1970s. Mink numbers at Kielder are now thought to be very low with few being spotted by rangers in recent years, but water voles do not travel long distances so it is difficult for them to re-colonise mink-free areas. Now, Northumberland Wildlife Trust,Tyne Rivers Trust and the Forestry Commission have received funding from the Heritage Lottery Fund to reintroduce water voles into Kielder as part of a project called Restoring Ratty. During the summer of 2016 water voles were captured from the North Pennines and taken down to Devon along with water voles from the Trossachs in Scotland. Here they have been captive bred and 317 voles from this breeding were reintroduced into Kielder Water and Forest Park in June 2017 a further 243 in August 2017. In the summer of 2018 similar numbers or animals will be released to boost populations. The water voles were released into the Kielder Burn area and the streams to the north of the reservoir with future release location decided upon after monitoring the spread of the previous release. The best place to look out for water voles is the Wildlife Hide on the Forest Drive but keep your eyes open near any burns above Kielder village. Alongside the reintroduction the project will run an educational programme for schools local to the donor populations and the reintroduction sites as well provide interpretation in Kielder and run events about water voles. Here is the video on the capture, captive breeding process and releases. Restoring Ratty has been supported by a grant from the Heritage Lottery Fund. Thanks to National Lottery players, we have been able to start work on the process to reintroduce Water Voles into Kielder. The ‘Restoring Ratty’ Kielder water vole reintroduction project has released a four-minute film to celebrate the first year of its Schools Partnership Project. Produced by local filmmaker Alan Fentiman, the film has one major difference - it was filmed and edited entirely by children, aged between 9 and 10 years of age. The film charts the capture of water voles on the North Yorkshire Moors by 20 pupils from Terrington Hall School in York and their transfer to the Derek Gow Consultancy in Devon for captive breeding which was filmed by 20 pupils from St David’s School in Devon. To complete the trio, last summer, 20 very lucky pupils from Bellingham Middle School were the envy of their classmates when they were invited to assist with the release and filming of water voles into the waterways of Kielder. • Water voles are legally protected in Britain and recent evidence indicates they have undergone a long term decline in Britain. They have disappeared from 94% of their former sites. On average, water voles only live about five months in the wild. They eat grasses and waterside vegetation. • The water vole is Europe’s largest native vole and has a rich, silky, yellowish-brown to dark brown coat, a blunt nose, a rounded body and a long hairy tail. It is often confused with the brown rat, which is slightly larger and has a pointed nose and a shorter, naked tail. • Water voles excavate extensive burrow systems in the banks of waterways and will have up to five litters per year, ranging from three to seven young. • Water voles were a common sight in UK watercourses until the 1970’s and 80’s, when a combination of escaped American mink (Mink are predators of water voles) and habitat loss started to reduce populations dramatically; the water vole is now absent from the majority of Northumberland’s rivers. • Between 1989-90 and 1996-1998 national surveys by the Vincent Wildlife Trust across the UK showed that water voles were lost from 67.5% of occupied sites (Ed. Jeffries 2003). Subsequently, the water vole is considered to be one of the most threatened mammal species in the UK. 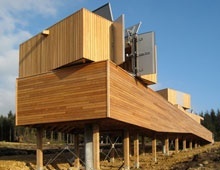 • The Forestry Commission has reversed the loss of grassy streamside vegetation in Kielder by replanting forests back from the stream edge after felling. This has led to a very significant increase in good water vole habitat. Mink numbers are greatly reduced in Kielder from a high in the 1980s, although there are still occasional records in the area. 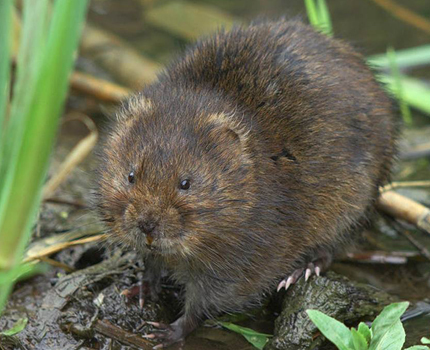 Download and enjoy our Water Vole Activity Book. Since 2014 the partnership of Tyne Rivers Trust, Northumberland Wildlife Trust and the Forestry Commission, have been working to ensure there is a suitable environment for water vole by establishing whether any mink remain, as this was the reason for their previous decline. 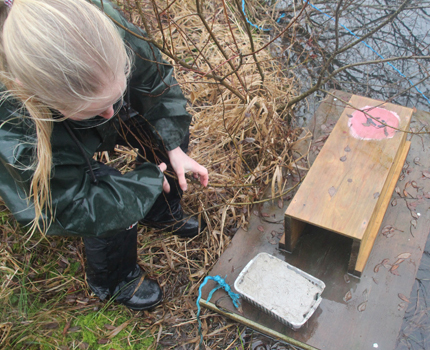 A key task in the project is to survey a search for mink across Kielder through sightings, droppings and using floating rafts which mink climb aboard to investigate, leaving behind tell-tale footprints. The rafts are checked every two weeks by volunteers. Over 1000 records were collected and only one possible mink footprint was found indicating that the area is suitable for a water vole reintroduction. The project also worked with the local community, collecting recollections and photographs of the wildlife and changes to the North Tyne Valley over the last 70 years or so will be compiled. 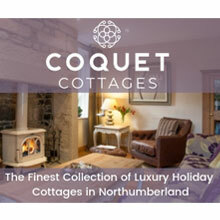 The landscape has changed significantly with the establishment of Kielder Forest and creation of the Kielder Water, northern Europe’s largest man-made lake, a major influence on both people and wildlife. Visit the Tyne Rivers Trust YouTube page for informative videos on a range of topics around Water Voles.